Dry, Steam Leather & Upholstered Sofa Cleaning St Michael's Hamlet L17 | Quality Property Care Ltd.
Is your sofa covered with nasty stains and you are thinking about changing it? Well, there is an cheaper and easier option - contact Quality Property Care Ltd.. The professional upholstery and sofa cleaning company offers efficient and safe stain treatment. The upholstery cleaning company can clean any kind of sofa: couch or settee, traditional sofa, convertible sofa, divan, settee, loveseat, hide-a-bed, sectional sofa, sofa bed, couch bed, sleeper sofa. The expert upholstery cleaning is done by insured, trained, vetted and experienced cleaners. Suitable for commercial and residential cleaning needs. Available 7 days a week at the best upholstery cleaning prices in St Michael's Hamlet L17 and the area. So, don’t throw out your soiled sofa just yet, call our customer care or send an online request for a free of charge quote now! After the cleaning, your furniture will look as good as new. Leather requires special care when being handled, specifically because there is no turning back one a mistake has been made. This is why we employ the finest leather cleaning professionals in the field to manage and produce safe, satisfactory results each time. This service can complete several tasks at once, not only remove a wide range of stains from a delicate leather sofa, but also fill cracks with a corresponding colour of the leather, clean mat leather, perform leather rejuvenation and use foam to properly eliminate heavy stains on almost any leather kind. The cleaning of the leather begins with the application of a rejuvenating agent which opens the pores of the materials making it easier for us extract any dirt. It also makes the leather softer and prevents it from cracking during the cleaning and in the future. Once the leather is ready we use a foaming agent which acts as a magnet for any of the filth that has been imbedded into the pores of the material. On one side we are able to not only remove deeply imbedded filth, but are also able to extract new and old stains alike without damaging the leather itself. For filling up any existing cracks we use a specialised filler which matches the colour of the leather upholstery, hiding away any unsightly areas. Once all stains and dirt have been extracted we use a cloth to remove any moisture from the leather to prevent it from bleeding into your clothes. As a natural materials leather require a bit more focus when it comes to cleaning maintenance, simply because if done improperly there is a chance of shrinkage and even more severe damage. This is why all experts who work with leather have gone through a special training course which familiarises them with the processes of cleaning leather, from a wide range of stains. Our cleaners are able to identify the type of leather, in case you cannot, and the stain that has occurred. There are several ways to remove stains and accumulated dirt from a leather sofa. One way is to use a moisturising agent which opens up the pores in order to get deep into the deposits of grime and filth. Once applied the moisturising agent will soak into the leather and does not need to be eliminated. It softens the leather, making it a lot more malleable and easier to clean. A special washing liquid is used on the affected spots so it can draw out all of the unwanted particles inside the pores of the leather. A second method is that of using a foaming agent which also opens the pores of the material and attaches itself to the filthy particles. This foaming agent is safe for the leather and does not leave any trace after it has been removed. How it works is that it attaches itself to the dirty molecules and once draw out with a cloth or a vacuum, it removes the dirty pats along with it. To clean other materials that are not leather and have fibers, we use a foaming agent or a dry compound which we apply directly on the spot. 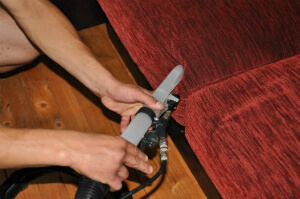 Prior to the application the upholstery and sofa are hoovered and cleaned of any debris and hairs. This allows us to better imbed the cleaning agents into the fibers, by agitating the material we can reach deeper and extract even more. Since this a completely dry procedure it can be used on more sensitive materials like silk and cotton, which do not like heat or water. There is a 12-15 minute waiting period for the cleaning agent to react, after that period the cleaning particles have bound to the dirty particles, making them a lot easier to extract. By using a strong vacuum machine we can extract all particles and leave only a clean upholstery underneath. There is no drying required as no moisture has been used.